There is a ton of information on the web and lots of academic studies looking at the use of LED grow lights for plant growth but a lot of it is confusing and ​does not ​provide many definitive answers even after hours of ​looking. 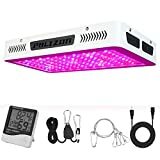 As aspiring expert horticulturists, we have now spent a great deal of time ​researching LED grow lights in the hope of answering the question of whether ​we should all be using this latest tech in all of our gardening endeavours. There are bound to be lots of you out there asking the same question, and so you don't spend (waste?) as much time as we have trying to make head or tail of this mountain of information (and disinformation! ), we created this website to summarise ​our findings and to answer questions from an amateur gardener's point of view. Are LED grow lights better than other light sources? 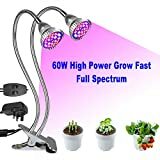 Other advantages of LED grow lights? For the totally uninitiated, light-emitting diodes (LEDs) are the same little lights that you find on everyday electronics, so for example, the pinpoint of light flickering away on this laptop (or is it an old-fashioned desktop?) that shows that it is alive and kicking or that the hard drive is working, is an LED. The LEDs used in LED grow lamps are essentially the same as these but they are much more powerful and a bunch of them are grouped together into a single fixture to provide plants with enough light for them to grow. ​Dual In-Line Package (DIP) LEDs: DIP LEDs are the traditional looking LED bulbs that one typically sees in old consumer electronics or electronics kits. They come in a few different sizes but in general they are relatively big and bulky, and they have a limit to how powerful they can be as they are not really designed to be used with cooling technologies such as heatsinks. 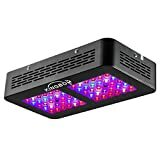 In today’s grow lighting, most consumer LED lights for plants no longer contain these DIP LEDs, and the ones that still do are generally not used by more serious growers. ​Surface Mount Device (SMD) LEDs: SMD LEDs are currently found in the majority of today’s LED growing lights available to the consumer. They consist of a diode with its own lens and electrical contacts, and usually there are many of them soldered into a single grow light fixture. Due to their surface-mounted design they are amenable to being bonded onto heatsinks for enhanced cooling which means they can be higher power than their DIP LED brethren. ​Chip On Board (COB) LEDs: COB LEDs are very similar to SMD LEDs, however they differ from the SMD type in that several diodes are grouped together to form a single LED chip, meaning that they only require a single pair of electrical contacts to power multiple LEDs. This allows for more diodes to be packaged together more densely while at the same time using less electronic components than the equivalent multiple SMD setup. ​UFO LED plant lights: UFO LED grow lights are named for their ‘Unidentified Flying Object’-like appearance. These LED growing lamps most often contain SMD LEDs and are generally limited in size to that of a kitchen plate meaning that they only light up a limited amount of surface space. UFO LED grow lights usually contain some form of heatsink and a small number of fans to keep the LEDs cool. 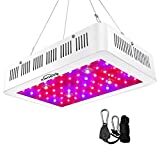 Due to their limited size, they tend to be used as the lower power LED grow lights available for the indoor garden or grow room. Click here for more information on the latest UFO LED grow lights available in the UK. 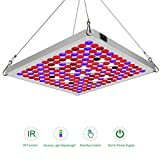 ​LED grow light panels: LED grow light panels are the next step up in size after the UFO-style lights, usually containing more fans and more LED bulbs. They are almost always rectangular in shape, with several tens or hundreds of individual LEDs within a single LED lighting fixture. More recently, some LED grow light panels have been designed to do away with the fans altogether and rely solely on the cooling effects of a large well-designed heatsink, saving on energy consumption and reducing overall noise. Click here for more information on the latest LED grow light panels available in the UK. ​LED strip lighting: LED strip grow lighting is most often used in professional horticultural settings where plants are grown on racks or shelves and the LED strip grow lights are attached to the underside of the shelves above. LED strip grow lighting usually consists of the SMD type of LEDs arranged along the strip since they are best suited to covering as wide a surface area as efficiently as possible. LED Inter-lighting: ​Inter-lighting is similar in structure to strip lighting in that it is composed of number of LED lights arranged in a strip. However, the LEDs in an inter-light differ from a down-facing toplight in that they project over a wider angle than the typical strip light. The inter-light is typically used by hanging it lower down, right in amongst the plant leaves and closer to the base of the plants. Inter-lighting solves a problem that is typical of top-lighting from standard man-made grow lights and of natural sunlight, in that as the plant canopy grows taller and thicker, the level of light in its lower regions gets progressively less as the leaves higher up increasingly block out the light. This means two things, firstly plants don't make full use of all of their photosynthetic capability as the lower leaves become shaded by the upper ones, and secondly, plants end up wasting valuable energy trying to grow taller and faster competing with the neighbours in a typical Darwinian fashion. Inter-lighting brings light to the lower regions of the plant canopy and several studies have shown that inter-lighting used in conjunction with top-lighting increases plant growth as well as fruit and vegetable yield compared to top-lighting alone. Inter-lighting has only become possible with the advent of low energy lighting since the inter-lights must emit very little heat being so close to the plants. ​Indoor herb gardens: Over the past few years, LED lighting has infiltrated the more mainstream ‘grow your own food’ consumer market with the integration of LEDs into the humble indoor herb garden. 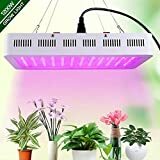 The modern LED grow lights-equipped indoor herb garden now provides almost everything needed to grow one’s own plants indoors, all within a compact package, and is especially popular amongst those who do not want to go to the trouble of building their own indoor growing space. Well, before we can answer that question, we have to know a little bit more about light itself. Without delving too deeply into the physics, light waves come in an array of different colours each with its own unique wavelength that is measured in nanometers (nm). So for instance, blue light might have a wavelength of 430nm or red light might be 660nm. Even different shades of the same colour have their own precise wavelengths within the range for that colour, so a deep red would be something like 700nm, whereas a lighter shade of red might be 640nm. Unlike conventional electric lighting which emits a range of colours simultaneously (combining to form the final white light product that we see), an LED essentially only emits light of one particular wavelength (in reality, it actually emits a very narrow band of wavelengths, but for our purposes, we can think of it as emitting only at its designated wavelength). Combining LEDs of different wavelengths into a single light fixture gives us the power to precisely control the colours of light that plants are exposed to, and in so doing, maximise exposure of our plants to light that promotes optimal growth, or that's the theory anyway! Since plants have evolved over millions of years to grow in sunlight (which consists of the whole spectrum of visible light plus ultraviolet and other non-visible wavelengths), our first instinct as to which is better for plant growth​ will typically be to vouch for sunlight. What could be better than beautifully natural sunlight stimulating our plants to grow? But before we dismiss the idea of human-made lighting, we should acknowledge that there is some evidence where one might argue that nature is not as optimally designed as it might first appear. There have been studies that have suggested that too much light (and in particular the yellow colour wavelengths) can start to stress plants out and inhibit their growth by suppressing chlorophyll formation. Since we are pretty sure that plants don't use every wavelength of light within sunlight and some wavelengths may even be inhibitory, this raises the question of what happens if we were to remove those undesired wavelengths. Is it possible to increase the level of growth in our plants? Another argument in favour of us having the potential to design lighting that is 'better' than sunlight is that nature evolved not to please us humans, but through a Darwinian 'fight for survival' mechanism from the point of view of the plant. So 'better' growth might mean different things from a plant's perspective than it does from ours and there might be some naturally-evolved plant processes that may be undesirable to us as plant growers. An example of this can be seen with fruit-growing, where we have become quite adept at crossing plants to produce 'better' varieties of fruit which do not contain seeds (for instance, seedless grapes or some types of citrus fruit). Yet the whole reason for a plant to produce fruit in the first place is as a mechanism for it to disperse its seeds - what possible use is there for a plant to have seedless fruit? - there isn't. Of course there are also other more practical reasons why we might not be able to grow our plants in sunlight, like we may not have the space to grow them outside in the first place or we may not want to expose them to the possibility of pests and diseases. Alternatively, we may live in a place that is often overcast (sound familiar?) or where the outside conditions are unsuitable for the type of plants that we would like to rear. Irrespective of our reasoning for growing plants under electric lighting, the problem we currently face is that scientists are a long way from fully understanding all the complicated systems and processes that go on in a plant in response to sunlight, and for that reason, given the choice between trusting a couple of hundred years of scientific endeavour versus millions of years of evolution, it's really a no-brainer. So when choosing indoor grow lights, we should try to stay as faithful as possible to the structure of sunlight, and we can use our current knowledge of what photosensitive pigments are found in plants as a guide to determining the wavelengths of light that are required for optimal plant growth, even if we don't yet fully understand what all their functions are. Clearly LED grow lights have a huge advantage in how long they last, and more importantly, they are far more electrically efficient i.e. they use a lot less electricity, which should be good news for our electricity bills. We did initially start out with a table comparing the energy and cost differences one might expect to achieve with the different grow lighting systems, but it proved to be too unreliable primarily because trying to get an answer as to what are equivalent grow lamps between one system and the next (for example HID vs CFL grow lights) appears insurmountable to us at the moment. The problem is that different lighting systems inherently emit different wavelengths of light with plants using some of them and ignoring others. So you can't just compare the Lumens or the Lux (measuring brightness) between lamp types because although you might be able to match them in terms of brightness, the individual wavelengths themselves and the usefulness of the light itself to the plants will vary. So you might think, ok, we should be comparing the photosynthetically-active radiation or PAR emitted from each light type. To measure PAR we appear to need to know the Photosynthetic Photon Flux Density (PPFD) in µmol/m2/sec of each type of light. Damn, can they make it more complicated!? So that means the number of photons (think light particles) that hit one square metre of plant surface each second. That's better. But this still does not address the problem of the differing wavelengths. ​So let's say that you have the required amount of PAR for your type of plants, say 400 µmol /m2/sec. If all 400µmoles of that photosynthetically-active light is of the same wavelength, let's say 660nm of red light, then surely that is not comparable to another type of light that is emitting the same 400µmoles of light particles but of 430nm blue light!? Clearly, the two different types of light are both photosynthetically-active radiation but each is going to have very different effects on plants since different plant pigments will be activated. Also, just on a more technical note, another beef we have with PAR is that it has been defined to include photosynthetically active wavelengths only between 400nm and 700nm! What about UV light (below 400nm) and far-red wavelengths above 700nm? It is pretty clear to ​us that they have a role to play in the plant - so shouldn't they be included? ​​plants can be placed closer to light sources thereby using the available light as efficiently as possible. ​plants tend to transpire less when it is cooler and therefore end up using less water overall. ​plants tend to slow down growth as they approach lamps that contain blue light and it is possible to get their growth to stop within an inch of the grow light. This provides for an exquisitely simple control mechanism for plant size without doing anything other than deciding the height at which the grow lights are positioned. 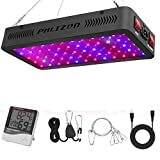 Practically, this can be achieved with LED grow lights, but not so with other lamps (assuming they emit blue-light in the first place) where the excessive heat emitted can damage plants when they grow too close. ​LED growing lights do not require ballasts. What's a ballast we hear you say. A ballast is some additional circuitry (usually in a bulky box) that is required in conventional grow lighting to prevent it from destroying itself. Ballasts use power to perform their function and this is another reason why conventional lighting is more costly to run. ​With conventional lighting systems, we have limited control over what wavelengths of light they produce without using additional filters. Filters are inefficient, provide us with a limited ability to select desired wavelengths, and add to the cost of the lamps. The nice thing about LED lighting is that we can select the wavelengths of emitted light simply by incorporating the appropriate LEDs, so it should just be a matter of getting the perfect combination together...that is assuming that we know what that combination should be in the first place! ​Theoretically, with LEDs, we have greater control over the intensity of light since LEDs are dimmable. Although we haven't currently found any LED grow lights on the market that have this feature, we would not be surprised if they are produced in the near future to give us greater control over our lighting regimes. ​and finally for the space scientist in each of us...recent evidence from NASA (who are trying to maximise the nutritional content of food for their future long-duration flight astronauts) suggests that through controlling the wavelengths of light that plants are exposed to, it is possible to increase the nutritional antioxidant content of vegetables (in this case, lettuce and radishes). RECENT: Grow Tents: Do I really need one? ​LATEST: ​What Vegetables Can You Grow Hydroponically?